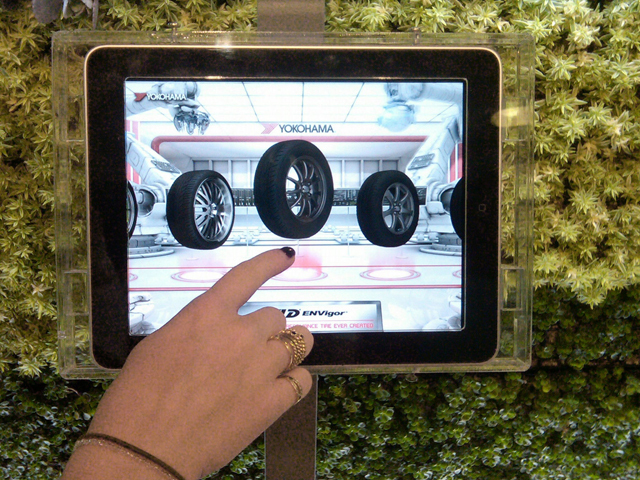 If you paid a visit to the 2010 LA Auto Show you might have had a chance to play with Yokohama Tire’s iPad app in their exhibit. If not, then it is now available for download for free in the iTunes app store. So, what does the app do? Well it allows you to browse through Yokohama’s full tire line up and get an up-close look at what makes each model unique. You can also spin the tires, zoom in, watch videos, and get info about specialty tires like their orange oil race application. Its a fun way to kill sometime and if you are in the market for tires then this app gets even more useful. I played with the app myself and had some fun with it. If I were to make any suggestion to Yokohama on this I’d say make it available for Android powered tablets and phones! FULLERTON, CA (Feb. 25, 2011) –Yokohama Tire Corporation’s new iPad app – the Yokohama Tire Explorer – introduced at the recent LA Auto Show, is now available free on iTunes.